Super delicious Rice Krispie Treats with Butterfinger candy bars mixed in! In a large saucepan, melt the butter and peanut butter together over medium heat. Add the marshmallows- stir until melted. Remove from heat and stir in the Rice Krispies. Stir in the Butterfingers (setting about 1/4 cup aside for the topping). Scrape the mixture into the prepare pan and press it evenly into the pan with clean hands. Let it cool. Cut the Krispie Treats into nine equal pieces and move them to a platter. If you plan to eat them as they are, store them in a covered container. If you'd like to add the topping, continue with the directions. Heat the chocolate chips and the shortening in a small glass bowl in the microwave (or in a small saucepan on the stove) until they are melted and smooth. Spoon the chocolate into a zip baggie, snip the corner and squeeze the chocolate into the corner. 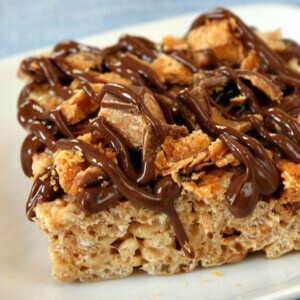 Drizzle chocolate onto each Krispie Treat, sprinkle with Butterfinger chunks and then drizzle more chocolate on top. Place the Krispie Treats in the refrigerator for 10-minutes-only to set the chocolate, then remove them from the refrigerator and store them in a covered container. *Don't plan to store these in the refrigerator or they will be too hard in texture to eat. *If you are preparing this recipe as gluten-free, just be sure to use the GLUTEN FREE Rice Krispies + brands of marshmallows, chocolate and peanut butter that are known to be GF. As of this writing, Butterfingers are GF.